I do love our amazing tram network in Melbourne. Melbourne established cable trams in 1885, and the system grew to 75 km of double track and 1200 cars and trailers, the fourth largest cable system in the world. Australia’s First Electric Tram in Melbourne operated between Box Hill and Doncaster in the late 1800s. The Victorian Railways operated an electric tram service from May 1906. 2006 marked 100 years of continuous operation of electric trams in Melbourne now operated by Yarra Trams. 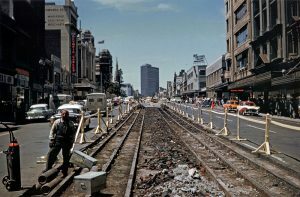 This shows trams once ran up and down Lonsdale Street Melbourne. 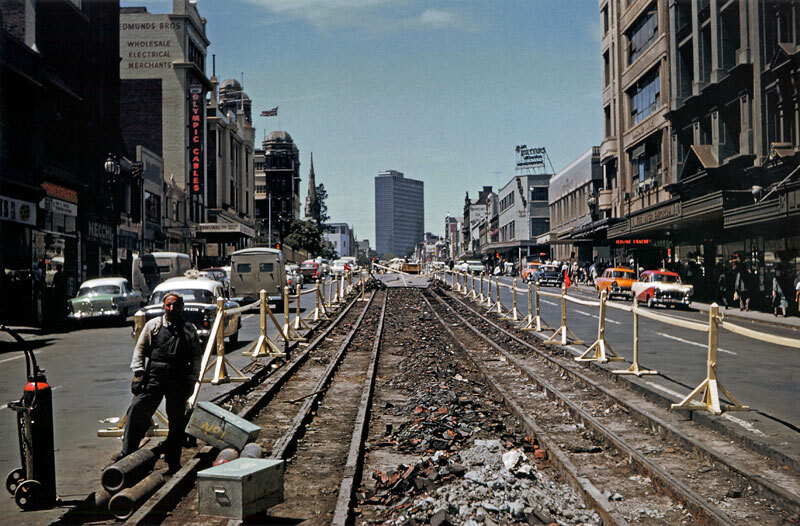 The postcard shows cable tram tracks being removed from Lonsdale Street in February 1962.